Looks like the members of ¡MURSDAY! have every reason to throw their own parade. After the first week numbers have come in, it’s clear that the masses are ready to join in. In first week sales, ¡MAYDAY! x MURS – ¡MURSDAY! hit the ground running and found itself with high chart placement all across the board. 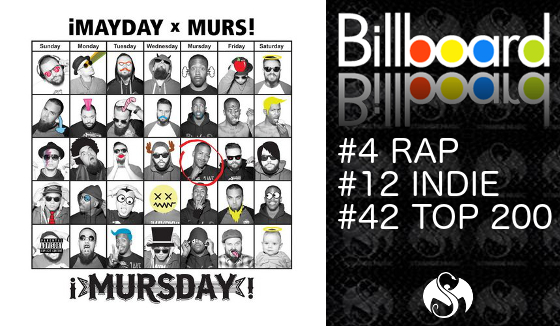 From this chart performance we can arrive at two conclusions: 1) the union of MURS and ¡MAYDAY! is a beautiful thing and 2) ¡MAYDAY!, along with the rest of the Strange Music roster, is growing rapidly. Congratulations to ¡MAYDAY! for continuing to grow as one of the most exciting forces in hip hop and to MURS for his exciting Strange Music debut! Shout out your props to ¡MAYDAY! and MURS below!